Be sure to check out the Spotted Hog® Bakery Page for more tarts! 12 Triple Scented Mini Bundt Cake tarts per pack. Each tart weighs a full 1.75 - 2 ounces, they're mini but they are big.Comes packaged in a window bakery bag. 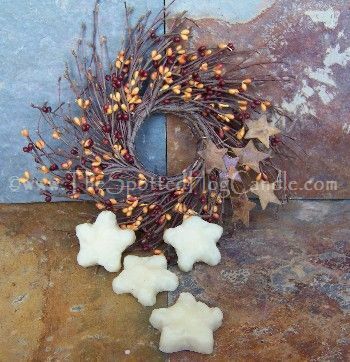 24 mini snowflakes per pack each one dusted with a sprinkle of Christmas Magic. Each tart weighs a full .5 ounces and are super scented.Comes packaged in a window bakery bag. Christmas tree shaped tarts dusted with fresh snow. Each tree is accented by hand to give every one a unique design. 1.3 - 1.5 ounces each. Burn time is a minimum of 10 hours each, net weight approx. 8oz. 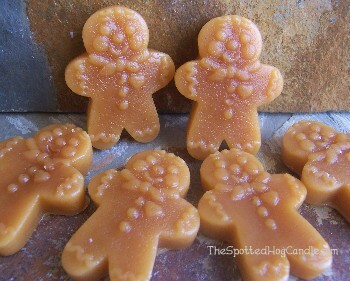 Cute little Gingerbread Men that look just like the real thing! A great way to try out new fragrances at a great price. These will arrive packaged in tin tie bakery bag. Burn time is a minimum of 12 hours each ! Enjoy One full pound of our brand new triple scented Spotted Hog® Tart Brittle. 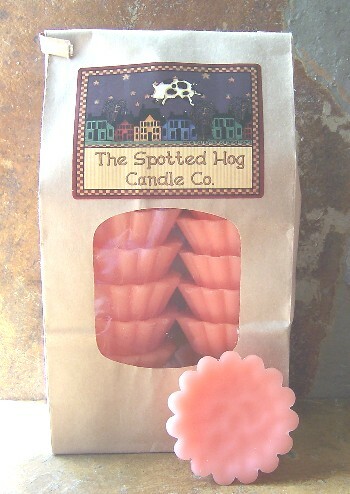 Just take a small handful and melt in your tart warmer or votive warmer. Our new Tart Brittle is very convenient and melts quickly. 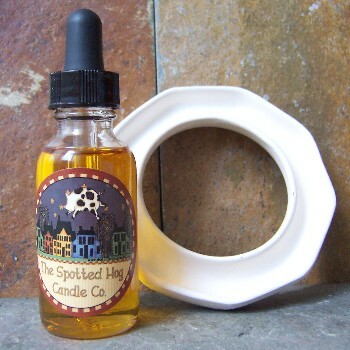 Your house will smell wonderful and the aroma is super strong and lasts amazingly long! Comes packaged as shown in our specialty lined tin tie bakery bags to preserve freshness and for convenient storage.Now pre-cut into squares and thicker for easier handling. This package is equivalent to 16 full sized tarts! Enjoy One full pound of our brand new triple scented Spotted Hog® SWIRL Tart Brittle. Just like the regular brittle but just more fun. Every batch is made to order and will have different and unique characteristics. 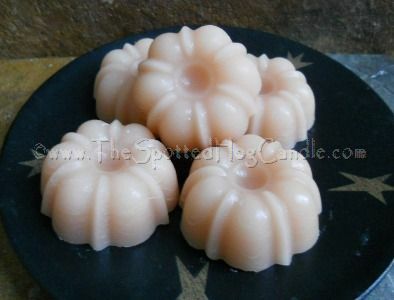 Just take a small handful and melt in your tart warmer or votive warmer. Our new Tart Brittle is very convenient and melts quickly. Your house will smell wonderful and the aroma is super strong and lasts amazingly long! Comes packaged as shown in our specialty lined tin tie bakery bags to preserve freshness and for convenient storage. Now pre-cut into squares and thicker for easier handling. 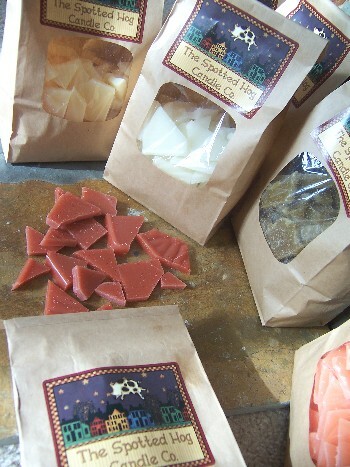 Triple Scented Spotted Hog® Tart Brittle 1/2 lb. 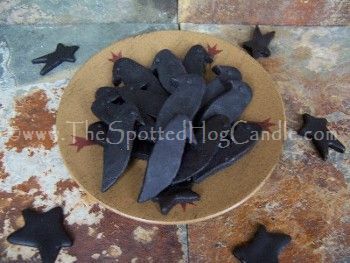 Enjoy a 1/2 pound of our triple scented Spotted Hog® Tart Brittle. 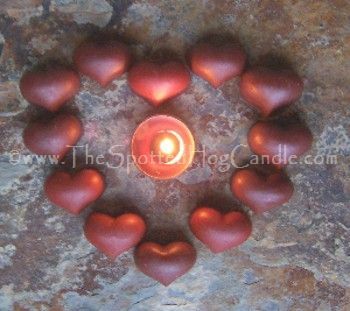 Just take a small handful and melt in your tart warmer or votive warmer. Our new Tart Brittle is very convenient and melts quickly. Your house will smell wonderful and the aroma is super strong and lasts amazingly long! Comes packaged as shown in our specialty lined tin tie bakery bags or special cello bags for 1/2 pound batches to preserve freshness and for convenient storage.Now pre-cut into squares and thicker for easier handling. This package is equivalent to 8 full sized tarts! 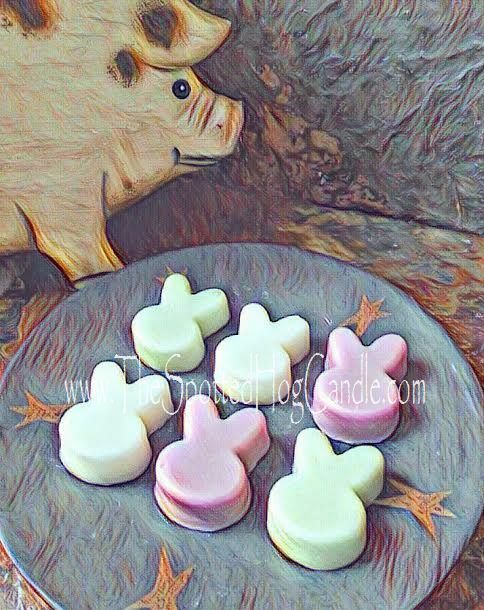 12 Triple Scented Hog tarts per pack. Each tart weighs a full 1.6 ounces. 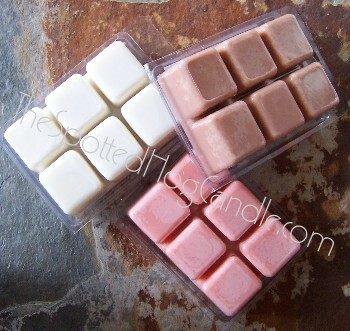 Add one to your tart warmer whole or cut in half to make 24 tarts, great to mix and match fragrances. Each one is very easy to cut in half by simply scoring the center and it will snap cleanly in half.Comes packaged in a window bakery bag. 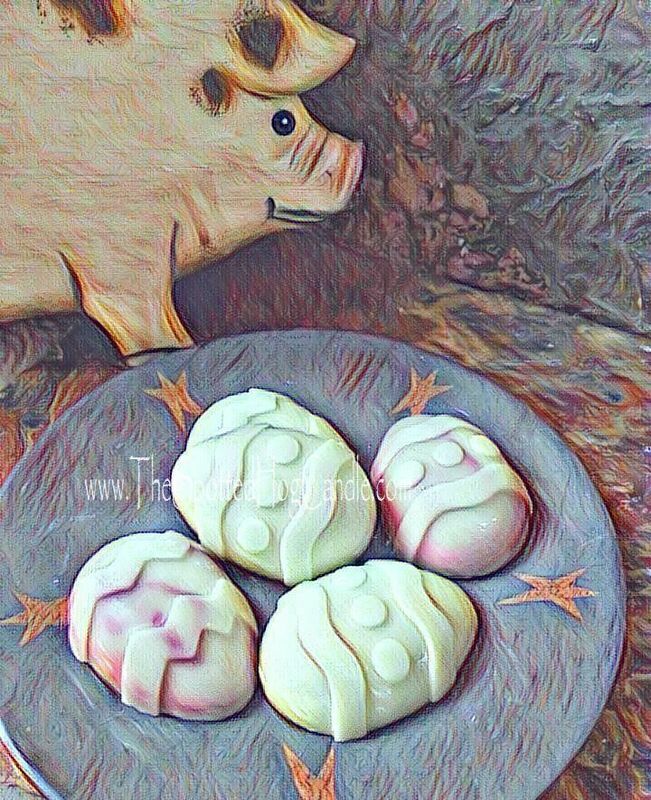 The Easter Piggy is bringing something special this year. Easter Egg shaped tarts. Each tart is equivalent to our standard sized tarts 1.2-1.5 oz each. Packaged in a window bakery bag. Choose a color swirl on white base or a solid color. Package of 24 mini Bunny head tarts. Each tarts weights approximately .5 oz. Packaged in a bakery bag. 12 Triple scented "Screamer" tarts per pack. Each tart weighs a full .5 ounces. Add one or two to your tart warmer,great to mix and match fragrances. Comes packaged in a Halloween bakery bag tied with a raffia bow. 24 Triple scented "Bats" tarts per pack. Each tart weighs a full .4-.5 ounces. Add one or two to your tart warmer,great to mix and match fragrances. Comes packaged in a Halloween bakery bag tied with a raffia bow. Each tart weight approx. 2-2.5 ounces each. Screams Halloween! A big bowl of creepy skulls sitting on your kitchen table. Super cute and great little Halloween decorations. Each tart weighs a full .5 ounces and are super scented.Comes packaged in a window bakery bag or Halloween bags if available. This Halloween make sure you have a 12 PATCH of Jack-O-Lantern tarts on hand. Super cute and great little Halloween decorations. Each tart weighs a full 1.3 ounces and are super scented.Comes packaged in a window bakery bag or Halloween bags if available. 24 beautiful white daisy melts/tarts. The flower is white or off white depending on the fragrance selected. Choose your own favorite color for the center. (Lemon yellow shown in picture.) 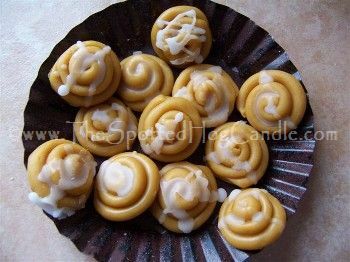 Comes packaged in a specialty lined tin tie bakery bag to preserve freshness and for easy storage. Choose from over 340 fragrances! Each Daisy weights approx. .6 oz each. Burn time is a minimum of 10 hours each. Cute little stars that look like the tops are made of cake! Burn time is a minimum of 11 hours. 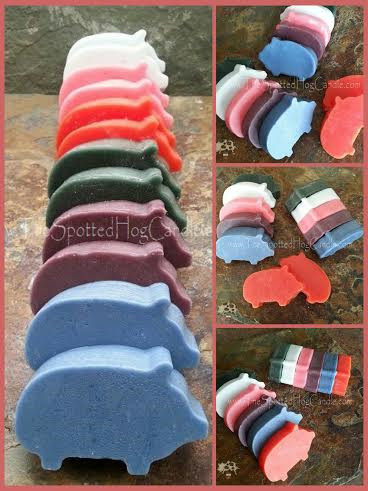 Look twice , There super scented crow shaped wax melts ! They are great to display on a plate or add to rosehips in a decorative bowl ! You get 10 crow tarts, packaged in a tin tie bakery bag. When you are ready to burn them , snap them in half and melt them in your tart burner . Burn time is a minimum of 6 hours each. These will arrive packaged in a tin tie bakery bag. Burn time is a minimum of 6-7 hours each. You would swear these came straight from the oven! Each Cinnamon bun is about the size of a quarter and triple scented with our famous CinnaBun fragrance and drizzled with cream cheese frosting....YUMMY. These look & smell wonderful on the table and smell even more incredible simmering in the tart burner. 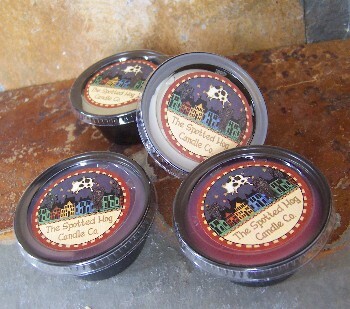 You will receive 4 individual tarts/melts in our cute little black cups with lid. All you do is pop the wax out from the cup and put it in your burner and enjoy many hours of fragrance! These tarts are BIG you may need to cut them in half if you have a smaller burner! Cute and functional. Stack and store, perfectly packaged to give as a gift. Each Tart Cup is 2oz!! Colors will coordinate with the scents selected. Choose 2 Bags of Blendables. Click here for mixing ideas! Our own original creation. 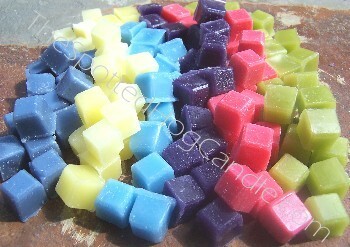 Intensely scented wax chunks that you can blend in your tart warmer to create your own one of a kind scent. Each bag of Spotted Hog Blendables™ is packaged with 141 cubes- net weight 10oz and packed in a specially lined tin tie bakery bag to retain scent integrity. You will get 2 (two) bags! Simply scoop a small hand full of chunks and start blending your favorite scents and see what you come up with! $19.95 per set of 2. *1.3 fluid ounces, ceramic lamp ring NOT included. 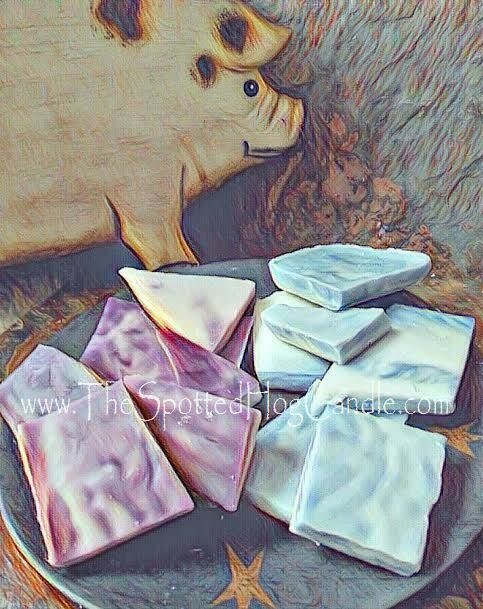 The Spotted Hog Candle Co. home fragrance oil is the purest, most concentrated form of the same great scents you enjoy in our candles and tarts. Use in a tart burner, oil warmer or light bulb ring to intensely scent a room in just minutes ... it's the fastest way to fill multiple rooms with fragrance. * Add up to 15 drops to any type warmer, a little goes a long way. * Can be used to refresh potpourri, car air fresheners, sachets, and lamp rings and much more. *These highly concentrated oils come in a glass bottle with an easy-to-use glass dropper. *Our home fragrance oils are almost 3 times larger then the majority of the home fragrance oils found elsewhere.